NASDAQ Dubai and Misr for Central Clearing, Depository and Registry (MCDR) today signed a collaboration agreement to establish technical links, which would benefit companies wishing to dual list their shares on the Egyptian Exchange and NASDAQ Dubai. www.iInvest.org.eg a site specially for educating the Egyptian investor. MCDR organized a workshop at Four Seasons Hotel on the 9th December, 2009, hosting Link up Capital Markets Group. The workshop was attended by Dr. Zeyad Bahaa ElDin, EFSA Chairman (Egyptian Financial Supervisory Authority), MCDR Chairman and Board of Directors, and participants of the Egyptian and Arab markets. MCDR fans shows extreme happiness after the match. Bravo to Mohamed Abdel Salam, Executive Chairman of the Egyptian Stock Exchange (EGX), who rang today's Closing Bell at NasdaqOMX MarketSite in New York, and whom NY Times calls EGX's "new shepherd." Congrats to all the EGX colleagues, senior diplomats, major investors and industry friends who witnessed this rousing event, promoting investment in the New Egypt. NasdaqOMX has provided EGX's trading systems since 1999. We in ACSDA and DTCC, who know Mohamed better as CEO of MCDR, Chairman of AMEDA and also the new World Forum of CSDs, will long remember his moving remarks about Egypt at CSD11 in Cape Town last month. Mcdr futsal team scored the Kuwait mini world futsal club tournament after beating Cardinal Ukrainian club 3 to 1 at the final match. Ramadan Samasery, Mohamed Edrees and Ayman Abdel Kader scored for MCDR at 16, 47 and 50 m., While the Ukrainian team scored his only goal at 20 m.
Mr. Mohamed Abdel Salam -Chairman- attends the final to support the team, where Sheikh Talal Al Hamad Al Sabah -High organization committee Chief- presented a memorial gift for Mr. Abdel Salam. MCDR celebrated the futsal team champs who scored the mini world futsal club tournament hosted by Kuwait. The celebration took place at MCDR premises in the Fifth Settlement and was attended by his Excellency Mr. Osama Saleh the Minister of Investment, His Excellency Mr. Taher Abou Zaid - Minister of Sports-, His Excellency Mr. Atef Helmy the Minister of Communication and Mr. Galal El Saeed - Cairo Governor. The Africa and Middle East Depositories Association (AMEDA) 19th meeting just concluded in Muscat, Sultanate of Oman from 8 to 10 March 2014. Mr. Mohamed Abdel Salam gained majority trust and was reselected as AMEDA Chairman for a new term, while Ms. Monica Singer –CEO South Africa Central Securities Depository (STRATE) – was appointed as Deputy Chairman. 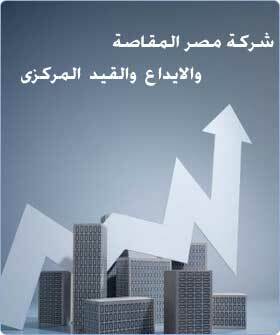 Procedures of calculating taxes of capital profits after selling securities listed in the stock market, as stated in the President’s resolution of Law number 53 for year 2014 with regard to Egyptian investors. The 20thMeeting for Africa & Middle East Depositories Association (AMEDA) has been inaugurated on Sunday, 9th of November 2014at the Kingdom of Bahrain and hosted by Bahrain Bourse during 9th – 10th November with the participation of more than 50 delegates representing 22 countries. MCDR and CIB agreed a partnership to create a pre-paid card for interested investors in the Stock Exchange to be able to access their cash dividends from ATMs as well as make purchases through POS. Thisinnovative initiative is to facilitate the process of accessing stock profitsof investors with ease and efficiency. Misr for Central Clearing, Depository and Registry (MCDR), represented by Dr. Tarek Abdel Bary - Managing Director- succeeded to join the board of the Association of National Numbering Agencies (ANNA) through the elections took place in Ireland. Worth-mentioning, it is the first time an African country gains the board membership where the board consists of 5 represented members; Germany, UK, Canada, Egypt and Mexico. MCDR's CEO Mr. Mohamed Abdel Salam and Maroclear's CEO Ms. Fathia Bennis have signed a cooperation agreement. The event was attended by his Excellency Mr. Ahmed Ehab Gamal El Deen, the Egyptian Ambassador in Morocco, where Mr. Mohamed Abdel Salam has granted his Excellency MCDR's shield of honor. ElMakkasa football team reserved its place in round of 32 in the CAF Confederation Cup tournament, after beating the the Ethiopian Defense team 3-0, on Saturday 27-2-2016 in Fayoum Stadium. Thus, ElMakkasa's aggregate score is 6-1, after scoring 3-1 in Ethiopia. Amr Barakat was the first to score in minute 55, by a strong kick. Sayed Hamdy's goal followed in minute 67, before Omar El-Nagdy sealed the match for ElMakkasa by a third goal in minute 89. ElMakkasa will play against Don Bosco from DR Kongo in March. National Settlement Depository (NSD), Russia’s central securities depository, and Misr for Central Clearing, Depository and Registry (MCDR), Egypt’s central securities depository, have signed a memorandum of understanding at the Moscow Exchange Forum. The CSDs agreed to develop their cooperation in order to provide investors with the access to the markets of both countries, to exchange information and experience in the sphere of depository and settlement operations and interactions via correspondent accounts, corporate actions processing and information services. In addition, the parties agreed to cooperate within the framework of the World Forum of CSDs. In the presence of the Minister of Investment and International Cooperation Dr. Sahar Nasr, GAFI’s Acting CEO Ms. Mona Zobaa signed two protocols with EGX Chairman, Mr. Mohamed Farid, and MCDR Chairman, Mr. Mohamed Abdel Salam about data sharing and listing procedures. EFSA acting Chairman, Dr. Mohamed Omran, and GAFI’s Vice CEO, Mr. Mohamed Abdel Wahab, both witnessed the event. Dr. Nasr stated that the two protocols aim at improving the investment environment, by developing and facilitating the listing procedures, and sharing electronic data. Providing services to investors will be handled through electronic systems, which promotes procedures and, and eventually is favorably reflected on Egypt’s rank in international reports, e.g International Finance Corporation (IFC). Minister of Investment and International Cooperation, Dr. Sahar Nasr, visited MCDR on 3rd October 2017, in presence of. MCDR Chairman, Mr. Mohamed Abdel Salam, Managing Director Dr. Tarek Abdel Bary, and MCDR board members. Mr. Mohamed Abdel Salam gave a presentation on MCDR’s activities and vital role in the Egyptian capital market. Dr. Nasr also toured the company and the Servers center and Disaster Recovery site. Her Excellency celebrated with the employees the 21st anniversary of the company. On Sunday 25th March 2018, MCDR held its annual general assembly meeting at the Helnan Hotel Land Mark, the fifth settlement, with the presence of Mr. Mohamed Abdel Salam – Chairman and Managing Director, Dr. Tarek Abdel Bary – Deputy Chairman and Managing Director and all the board members. Mr. Mohamed reviewed the company's activity report and the financial status of MCDR in 2017. Besides, Mr. Mohamed along with the board members sighted the developed parts in the Land Mark. Mr. Mohamed Abdel Salam won the MCDR Chairmanship elections held yesterday, Monday 3rd September 2018. 97.5% voted for Mr. Abdel Salam, against 2.24% invalid votes, and 0.24% for Dr. Ashraf El Dabe. The election process started after having the quorum of the general assembly with 79.7%. Duly, Mr. Abdel Salam will hold this office for three more years.